In recent weeks two figures of American letters have come under some fire. One hundred years from now, despite or because of his controversy and influence on American literature, Gordon Lish will be remembered and his contributions continued to be studied; 2014 may be remembered as the year his poetic and pedagogical ethics and methods were put on trial. But I’ll write about Lish soon enough and with finer nuance. Today, I’m going to write about the other figure who has confronted criticism recently. And I’m going to harangue for a minute because the subject is plagiarism and few things grate my cheese like plagiarism. 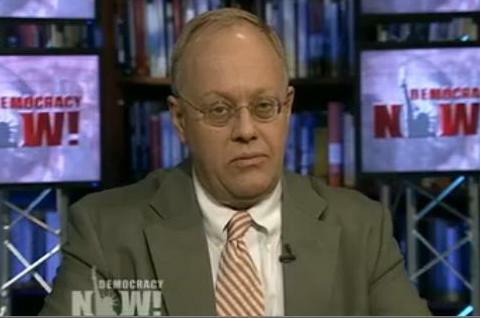 On June 12 The New Republic called Pulitzer Prize recipient Chris Hedges to task for extensive and egregious instances of plagiarism. He’s plagiarized Hemingway, he’s plagiarized fellow journalists, and he’s plagiarized himself. Now, it’s only fair to say that Hedges has his supporters. But I believe they rally behind him for romantic moral reasons. Of Hedges and certain writers like him it’s been known for some time that one can open any of their books to a random page and another of their books to another random page (even two random pages in the same book) and read essentially the same series of meaningless and rhetorically inflammatory sentences, the emptiness of which damages progressive thought and politics rather than benefiting them. Self-plagiarism, I had assumed, is the wheelhouse of such authors. How else do you explain publishing four books a year in some cases? (Between 2006 and 2010 Hedges published two books a year.) I’m not surprised by the discovery of Hedges’ dishonesty. I am surprised it’s taken this long for members of influential media outlets to discover it. And I’m bummed out that the crime will be forgotten in a week, forgiven in two, and repeated in three. Hedges, and certain writers like him, talk a big, flowery game about the evils of neoliberalism and empire and the rise of brain-dead politics coinciding with the death of the Keynesian state. But they’re poachers, neoliberals themselves, demanding morbidly obese honourariums for redundant presentations, legitimating their claims on the premise they were once hippies, when in fact they are truly interested only in feeding their egos by cultivating a following of graduate student marionettes whose future is threatened by the very mentors who believe themselves intellectual martyrs if only they can hide their incomes and repeat the word “grassroots” often and loud enough. Quoth the poet Stephen Berg, “Nothing is more destructive to a community, to creativity, than the desire to be seen as a good person and the deceptions that are mobilized to make that happen” (“The Poetry Does Not Matter”).